Fight C B Dolloway on Fox Sports on December 19 in Orlando FL. Nate Marquardt began his training in the martial arts as a teenager, studying the disciplines of Brazilian Jiu-Jitsu, Kickboxing, and Kenpo under instructor Alastair McNiven. After 3 years he was also training under BJJ expert, Ricardo Murgel, whom he now has a 2nd degree black belt under, and he also started training Freestyle Wrestling. Active in sports throughout High School, he contends that he did not become involved in martial arts until he saw footage of the Ultimate Fighting Championship. Marquardt has also trained with Sanae Kikuta and the GRABAKA Dojo in Tokyo, Japan, under Shane Pitts who gave Nate a black belt in Japanese Ju-Jitsu, and under Mike VanArsdale at the Olympic Training Center in Colorado Springs, Colorado and many other coaches including Greg Jackson, Firas Zahabi, T Wittman, Marc Montoya, Loren Landow, Bryan Youngs, Jake Ramos and Christian Allen. Nate first won the Pancrase Middleweight title in 2000. At the time, he was the youngest fighter to ever own the title “King of Pancrase.” Marquardt fought in Pancrase until 2005 and won 7 title fights in the process. Nate left Pancrase as the champion to pursue his dream of fighting the best fighters in the world. Nate has aquired wins in the UFC over top fighters such as Wilson Gouveia (KO), Demian Maia (KO), Jeremy Horn (Sub), Dean Lister (Dec), Martin Kampman (KO), Joe Doerkson (Dec), Ivan Salaverry (Dec), Rousimar Palhares (KO), Dan Miller (Dec) and more. 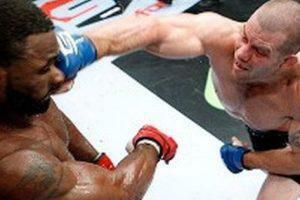 Nate signed with Strikeforce in early 2012 and won the Welterweight world title defeating previously undefeated Tyron Woodley by knockout. Marquardt signed back with the UFC at Middleweight in 2014. In June of 2014, he defeated James Te Huna in Auckland, NZ.